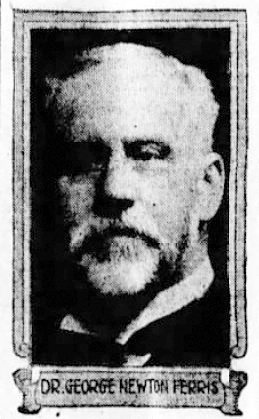 One of the many leaves on the Ferris Family tree belongs to George Newton Ferris (1854-1919). He was the great-great-great-great-great-grandson of Jeffrey Ferris through his son, Peter. The man was of some note in 1880’s Brooklyn, where he practiced medicine and was a community leader. What caught my attention was a piece from the Brooklyn Eagle dated September 27, 1886. It was a story about conditions at the Flatbush Insane Asylum and the reporter was conducted through the institution by our Dr. Ferris. It was, as you might expect, a horrifying experience. “I will afford the EAGLE every information that lies in my power,” replied Dr. Ferris. “To begin with let me say, that this building when constructed was planned to contain as a maximum 800 patients. Today we have 613 men and 870 women under our care, not including 56 patients who are now at St. Johnland. Making a total of 1,539 patients to be provided for, where there was originally to be intended to be but 800. So today we have 1,433 patients in our care to be literally packed in a space constructed to hold 800. To watch over these we have only five doctors, fifty-nine male and sixty female nurses. That means that every female nurse has over one hundred patients to attend to, and those familiar with the treatment of insane persons must know what a terrible responsibility that is. So with the male nurses. They, as the figures show, have 100 patients each to look after. The pay of the nurses is but from $14 to $20 a month and their hours of duty from 6 in the morning until 7:30 at night. No wonder the nurses are leaving us all the time and that is is almost impossible to keep good, experienced ones, although I will say that we have some excellent male and female nurses with us today. … I will begin by showing you the worst part of this institution. I will take you into the basement wards, where the troglodyte patients are kept.” Down two flights of steps the reporter followed the doctor. A strong, thick, wooden door, that swung noiselessly upon its hinges, was opened, and as it closed the reporter found himself in a long corridor, at least three feet below the level of the ground. This place has been condemned by grand juries, physicians, visitors and others, but owing to the overcrowded condition of the institution what was originally intended as collars, store rooms, wash houses, and other work rooms, is now the abode of that class of insane persons which the doctor classified as the living dead. 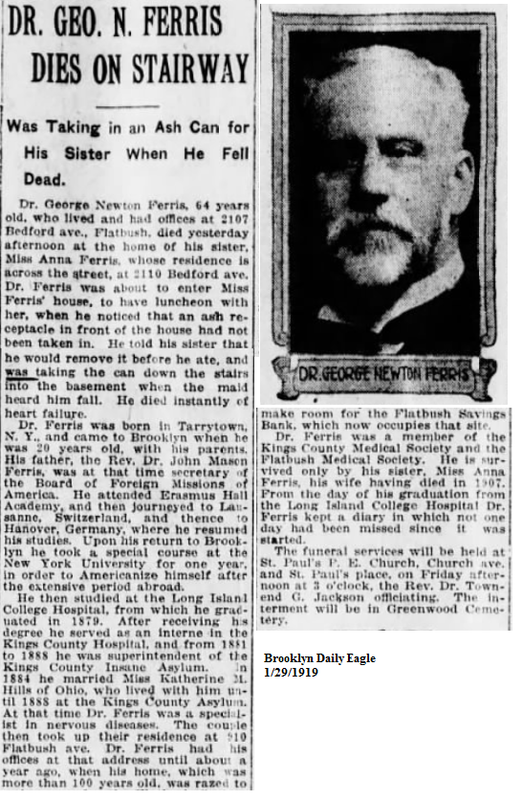 … Now let us go and see what we may term the harmless insane;” and Doctor Ferris led the way up two stories and with the same key opened the strong door that gave admittance to the various wards upon that floor. It was next to impossible to find in some cases here any proof of insanity, so far as the expression and action of the patients went.